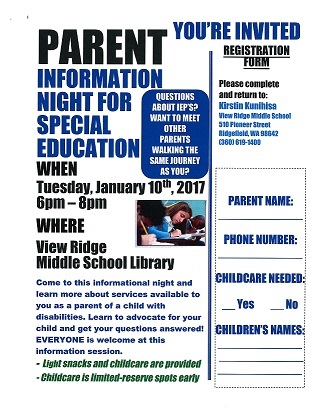 A Parent Information Night for Special Education is scheduled for Tuesday, January 10th from 6:00 – 8:00 pm at the View Ridge Middle School Library. This informational forum will provide important information to parents of children with disabilities and give them an opportunity to meet other parents of special needs students as well. Dr. Michael Baskette, Director of Special Education, realized the need for Parent Information Night after many questions continued to arise from parents he spoke with since the start of the school year. Baskette added that some community members also voiced concerns that some families were unaware of the different service providers available in the community that could be of help to special needs students. A resource fair is planned later in the school year to bring service providers from the community together to educate parents about the services they provide. Parent Information Night for Special Education is open to everyone. Childcare will be provided, but parents are required to register to reserve limited childcare spots. For more information and to register, contact Kirstin Kunihisa at View Ridge Middle School at 360-619-1400.